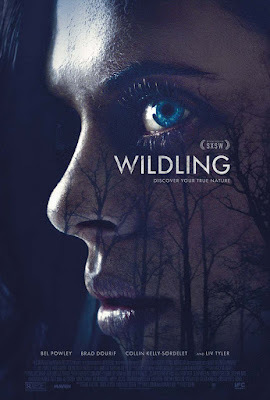 The folks at IFC Midnight have a great eye for what their audience likes, and just before it debuted at SXSW they picked up the werewolf horror, Wildling. The film played and was met with enthusiastic response from the genre crowd, and based on the new trailer it's easy to see why. It has Diary of a Teenage Girl star Bel Powley in what looks like a role with some real teeth to it. A teenage girl’s coming of age comes with a terrifying twist in this spellbinding take on the werewolf legend. Since birth, Anna has been raised in isolation by a man she knows only as Daddy who has done everything possible to conceal the truth about the girl’s origins from her. But when the teenage Anna is suddenly thrust into the real world under the protection of no-nonsense police officer Ellen, it soon becomes clear that the young woman is far from ordinary. Unable to adjust to a normal life, Anna finds herself drawn instead to the wild freedom of the forest while struggling to resist the growing bloodlust that has awakened inside her. This moodily atmospheric thriller combines supernatural scares with a myth-like tale of self-discovery. Wildling hits theaters and VOD on April 13th.